Access to 26 pets (plus every possible evolution) for account-wide use in both PvP and PvE. 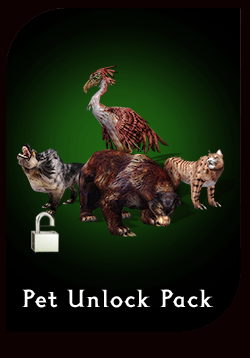 Does not include Prestige pets.Pets included in this pack are: Albino Rat, Black Bear, Black Wolf, Crane, Crocodile, Dune Lizard, Flamingo, Hyena, Iguana, Jahai Rat, Lion, Lioness, Lurker, Lynx, Melandru's Stalker, Moa Bird, Mountain Eagle, Polar Bear, Raven, Reef Lurker, Tiger, Warthog, White Crab, White Tiger, White Wolf, and Wolf. Get full access to 26 pets, including every possible evolution - for use in PvP and in PvE. Never fight alone! How to redeem - Once purchased, please go in-game and travel to the Zaishen Menagerie, located in the Battle Isles. Within the Menagerie Grounds, all of your unlocked pets are available to be charmed using the Ranger skill Charm Animal. Members of the Zaishen Order housed in the Menagerie can provide detailed information about each pet, specific pet evolutions, techniques for leveling pets, and other services. Limited to non-Prestige pets. Prestige pets may be unlocked through various in-game achievements.